Remember the Alamo is a world premiere Neo-Lab original being performed at The Neo-Futurist Theatre. The show is created by Neo-Futurist ensemble member: Nick Hart and directed by Neo-Futurist Artistic director Kurt Chiang. This production promises its audience that they will help the actors fully recreate the Alamo battle. This show contains more than that, it also has themes of death, interesting facts about Phil Collins, and a narrative of what it’s like to be mixed-race in America through individual personal narratives. I found the story of Santa Anna/Brenda (Brenda Arellano) and Nancy/James Bowie (Nancy Casas) to be the most compelling in this show, both are played by hilariously funny women. Every time they came on stage I couldn’t take my eyes off of them. Both James Bowie and Santa Anna, leaders of opposite sides in the battle, were extremely problematic and complex men. Men who are idolized by history despite abusing their power, and taking advantage of young girls It’s a hard task to make these dangerous men into a funny and poignant caricature, but these two women seamlessly blend themselves and their characters. They manage to heighten and devalue the lives these men made through their own lived experiences; making the men sympathetic and revolting. The distinction was also clearly shown through their demagogue costumes designed by Uriel Gomez. Confession: I really wanted, and still do want, Santa Anna’s and James Bowie’s costumes. Unfortunately, beyond these two characters the show needs much work. The other characters and general storytelling are incredibly confusing. A lot of the comedic moments did not hit correctly, and it seemed to me the audience only laughed out of nervousness. Nervous laughter plagued the show, as the writing disregarded intention versus the impact the jokes had. This could be fixed with some quick adjustments, and multi-versed narratives. The lack of complex plot is a recurring disappointment. The others B-plot personal narratives rely on the main character Nick/William B. Travis (Nick Hart), which could have benefited from the support of multiple narratives. We are teased with interesting characters who sacrifice real character development in order to further the story of the main character. The end of the play left audiences with many unanswered questions, such as what is it like to have a story be taken and manipulated and who has a right to tell the story? The show also falls short when it comes to audience interaction ; even the name tags audience members were given with different names of people who fought in the war, were only quickly met with a slight acknowledgement. The Neo-Futurists typically succeed at this element so it was especially surprising. 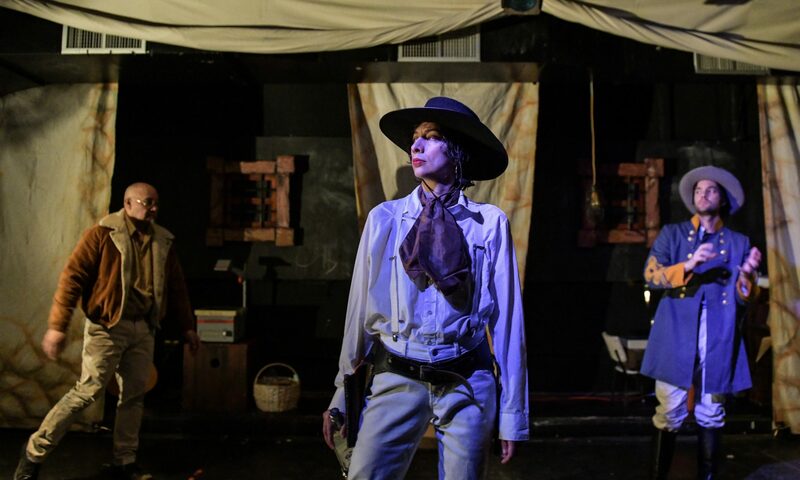 There were some very interesting truths addressed in this play, such as how white Texans profited off of slave labour, bowie knife history, searching for identity, and false truths in our history. Each issue is was only briefly touched upon. Ultimately the play takes the easy way out on many of the topics it could have covered, making it very surface level. The show’s concept does have serious potential, if it sticks to a few topics and explores them deeply, and reworks its dialogue. Remember the Alamo tries to find its balance between comedy and complex issues, imploring its audience to ask how their identity of false truths and revelations can shape the future and the past. Remember the Alamo runs at The Neo-Futurarium until April 27th.